The Prospector's Crossing (Prospector's Path in the PAL-version) is a room inside of the Secret Mine in Luigi's Mansion: Dark Moon. The Prospector's Crossing is accessed by south door inside of the Terminal. The Prospector's Crossing is a small room with a frozen body of water covering up a large portion. Stepping on this sheet of ice causes it to crack, but it does not break unless another object or person, such as the Toad assistant, is stepping on it as well as Luigi. A barrel and a box can be found near the door to the Terminal. There is a pickaxe hanging on the southeast corner of the room. The door on the north leads back to the Terminal while the door on the south leads to the Drift Hall. During D-1: Cold Case, Luigi needs to go through the Prospector's Crossing in order to reach the alternate access area of the Airway. If Luigi tries to cross the ice sheet while carrying Toad or Toad following him, the ice collapses and the Toad, whom like other Toads in the game has a fear of water, runs back to the door. Luigi must use his Poltergust 5000 to pick up the Toad assistant and shoot him across the frozen body of water. Luigi can safely cross this area after. Vacuuming the pickaxe causes the wall to move forward, revealing a lot of coins, bills, and Gold Bars. The poster on the opposite wall can be pulled off to reveal a gold spider. 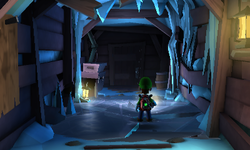 Starting on D-2: Hit Rock Bottom and most missions after, even though Luigi does not need to visit the Prospector's Crossing in other missions, if Luigi ventures into this room again, there is a sapphire frozen in the middle of the sheet of ice. Luigi is not heavy enough to break this ice by himself and the Toad assistant is no longer with him. Instead, Luigi must go to the pickaxe and vacuum it once more. Instead of releasing money, it drops a log. If Luigi carries this log onto the sheet of ice, it collapses and frees the gemstone that was trapped.